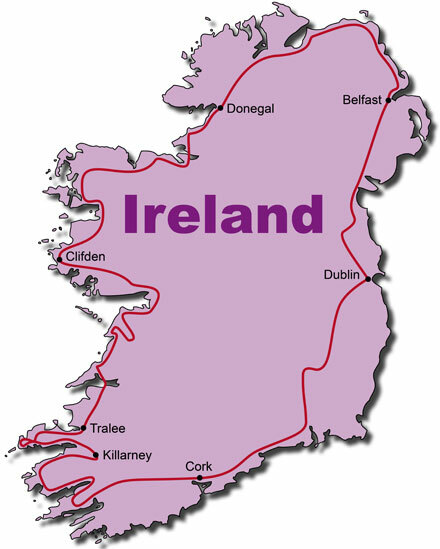 Discover with us, the Emerald Isle on this 7 day KeaRider motorcycle tour of Ireland that will take you on around the whole island. Your road trip begins in the Northern Ireland capital of Belfast and leads you past beautiful country roads with ancient castles and abbeys over to the west to Donegal. Visit Dunluce Castle, Kylemore Abbey and the famous Cliffs of Moher, then the world famous Ring of Kerry awaits you, a roundtrip through the picturesque peninsula of Kerry with its rugged mountains and impressive cliffs. Through the seaport of Cork and the Hill of Tara, you will finally reach Belfast, where your motorcycle tour through Ireland ends with a freshly drafted Guinness and a glass of Irish whiskey. After an individual journey, tour participants meet in Belfast, you will drive past the famous old castles of Carrickfergus and Dunluce to Donegal. Today takes you from the Ben Bulbin Table Mountain to the Abbey of Kylemore and next to the beautiful Connemara National Park. Accommodation is in Clifden. Along the Irish west coast, cruise through the lush green hills and visit the Dolmen and the famous Cliffs of Moher. Accommodation is in Tralee. The next stage takes you further south over the Connor Pass and the lovely Irish town of Dingle to Killarney where you will spend the night. Today you will experience one of the most beautiful parts of Ireland a round trip on the Ring of Kerry. You will cruise on to the Ring of Beara and over the Healy Pass to the southern Irish port of Cork. In the Heritage Center of Cork you can find information on the numerous Irish immigrants, who traveled from here to the new world before you continue your trip. Via Waterford and Kilkenny Castle you will reach the lively capital Dublin in the evening. The last day of your motorcycle tour leads you back north to the legendary Hill of Tara the seat of the old Irish Kings before you reach Belfast or start your individual journey back home.